BJP president Amit Shah during an election campaign in Meghalaya. If BJP is voted to power, Meghalaya would be turned into a model State within five years. This was promised by BJP’s national president Amit Shah during his visit to Meghalaya on Friday. 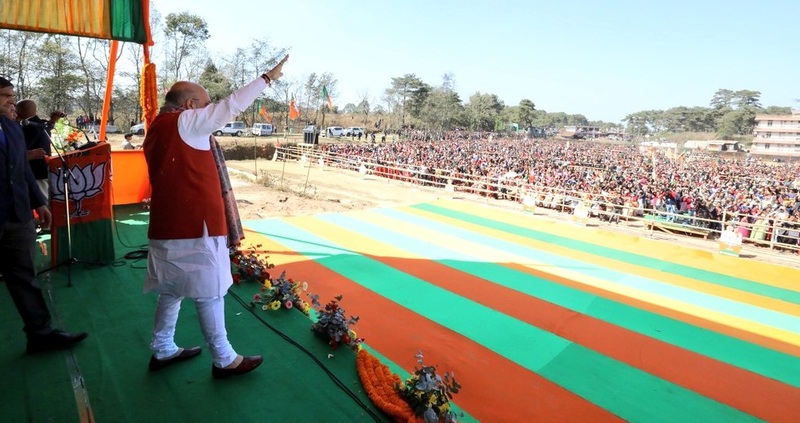 While addressing two election rallies in Meghalaya on Friday, Shah called to dethrone the present Congress-led Meghalaya government, which he claimed, has committed scams after scams in its 10-year rule. Claiming that the “acceptance of the BJP in the Northeast has increased day by day” Shah assured that “if the BJP is voted to power, Meghalaya will be turned into a model State within five years”. 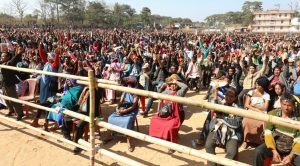 In the morning, Shah first addressed a rally at Jowai in West Jaiñtia Hills district, about 63km from here and later at around 3.40 pm he addressed another rally in Shillong. Crowd at BJP president Amit Shah’s election rally in Meghalaya. Shah further claimed that during the UPA government led by Manmohan Singh as Prime Minister, the Congress that led the government in Meghalaya at that time used to get Rs 5,817 crore in the 13th Finance Commission under the 14th Finance Commission, but the NDA government has increased this amount to Rs 25,400 crore. The BJP president also highlighted various Central schemes provided to Meghalaya which include Mudra (Rs 463 crore), Uday (Rs 600 crore), Swachh Bharat (Rs 4 crore), urban transportation (Rs 46 crore), AMRUT (Rs 80 crore), tourism (Rs 100 crore), sports complex (Rs 7.5 crore), and Jowai road (Rs 67 crore), and Sonapur (Rs 43 crore). Despite huge amount of money provided to the State government by the Central government, development has not taken place in the State, Shah claimed.